Times Square 2013 will be a spectacular event, full of sights, sound and special effects, featuring the New Year's Eve Waterford Crystal Ball, that descends the flagpole atop One Times Square at midnight. 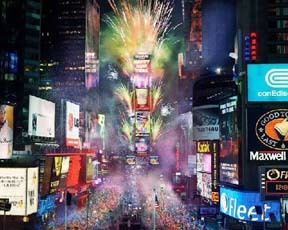 Although the first Times Square New Year's Eve celebration -- the tradition of the Ball Lowering in Times Square has become a universal symbol of welcoming the New Year. The place: One Times Square, formerly The New York Times building. The Building is located at the southern end of the "Bow Tie" of Times Square between 42nd and 43rd Streets on Broadway/Seventh Avenue. THERE ARE NO TICKETS SOLD; this is a FREE event. Bring some sandwiches, snacks, and a thermos of piping hot cocoa. Warning: Strollers and folding chairs can be a nightmare. Manhattan bus routes will be affected by the street closures around Times Square. Holiday parking rules will be in effect. Leave bags and backpacks at home - NOT permitted. Get a hotel room with Times Square View and order room service. Each year, hundreds of thousands of people descend upon Times Square to experience this free event. If you are planning to join the festivities, get there early and be prepared - you'll be corralled into barricaded areas where you'll have to stay for the duration. If you leave, you can't get back to where you were. 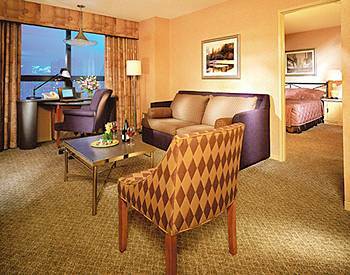 Your best bet get a room with Times Square Ball Drop View and joint in the party.